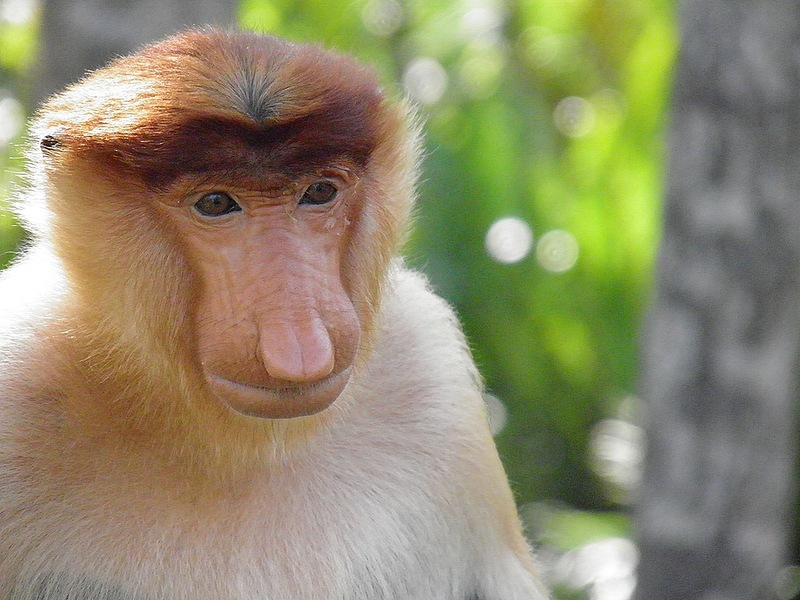 On my recent trip to Sandakan I spent a pleasant half day at the Labuk Bay Proboscis Monkey Sanctuary. Due to limited time, it was a toss up between this place and the Sepilok Orang Utan Sanctuary which is also close to Sandakan. Since I had already seen an orang utan reserve in another part of Borneo, I opted for the proboscises. 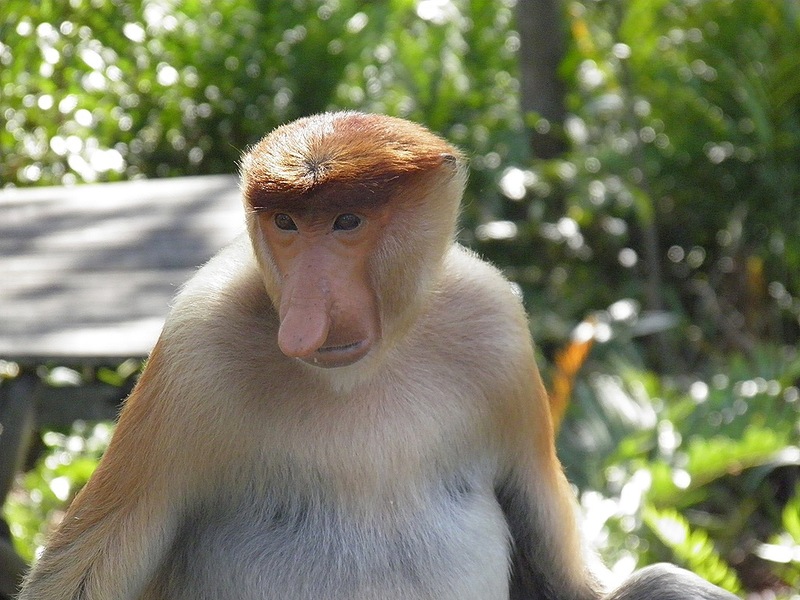 Proboscis monkeys are native to Borneo. They were once widespread in the mangrove forests along the coast and on river banks of this massive island but due to rampant deforestation and destruction of their natural habitat they are now highly endangered with only a few thousand left in the wild. Even at Labuk Bay, the monkeys’ domain has been reduced to a narrow strip of coastal mangrove, surrounded by oil palm plantations. 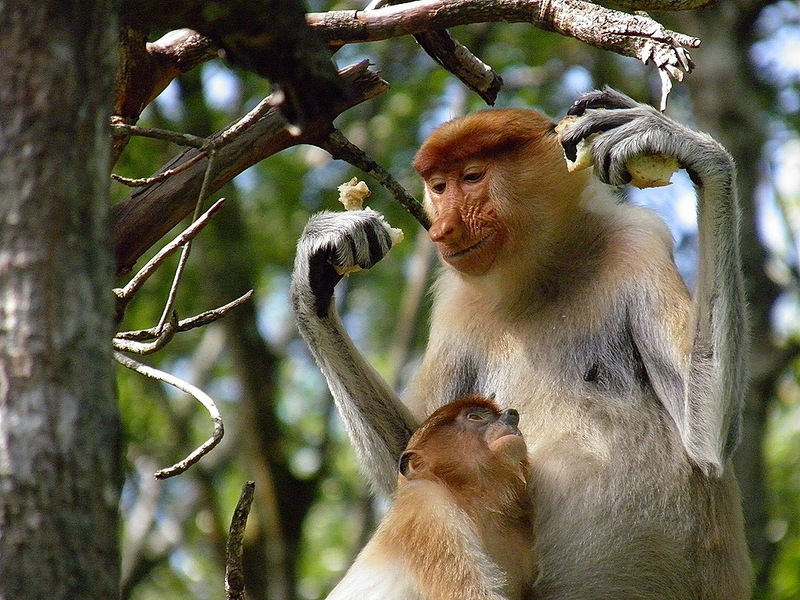 At the sanctuary, a few dozen monkeys, divided into two or three family groups*, emerge from the trees at feeding time and sit down on platforms to enjoy a meal of fruits and vegetables handed out by the park rangers and watched by tourists. Their natural diet includes tough, chewy mangrove leaves and they are equipped with a second stomach, like a cow’s, to help them digest the leaves. 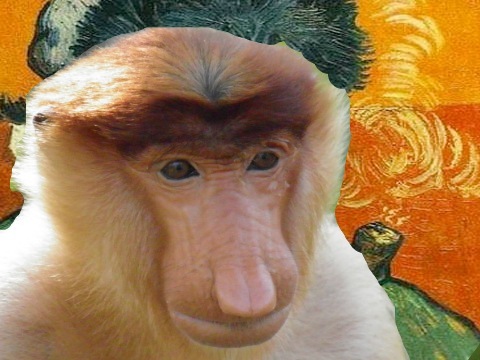 The strongest and most dominant of the big-nosed male monkeys has a harem of wives and lots of babies. Smaller or younger males form a bachelor group, sitting around in bored frustration and flirting with the wives when the boss is not looking – but he always is looking. One day, when the boss gets old and weak, one of them will take over the harem. The longer I spent looking at these curious creatures, the more like humans they seemed. They have the same human frailties; lust, greed, anger but they also like to play, tease, and cuddle as this mother’s seemingly smiling face shows. 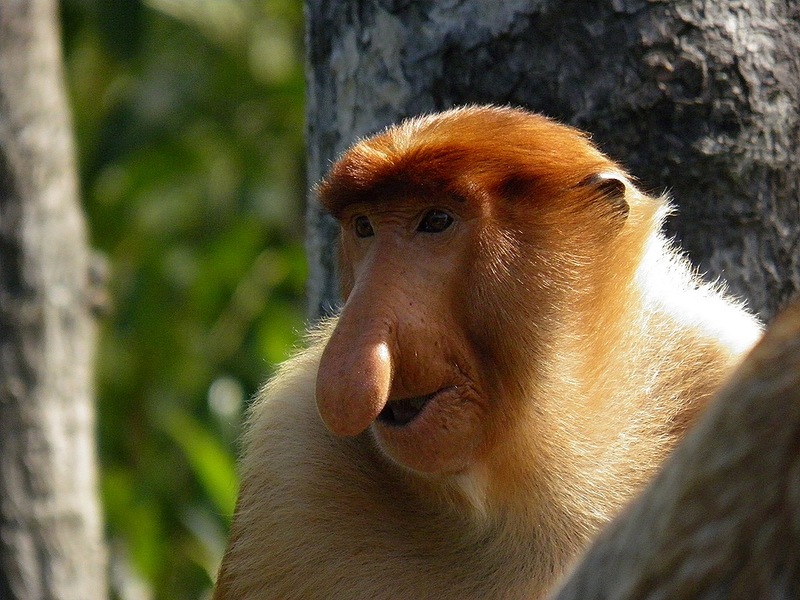 Let’s hope that the countries which share the island of Borneo (Malaysia, Indonesia and Brunei) can set aside much larger areas for the proboscis monkeys and other endangered species to ensure their long term survival. 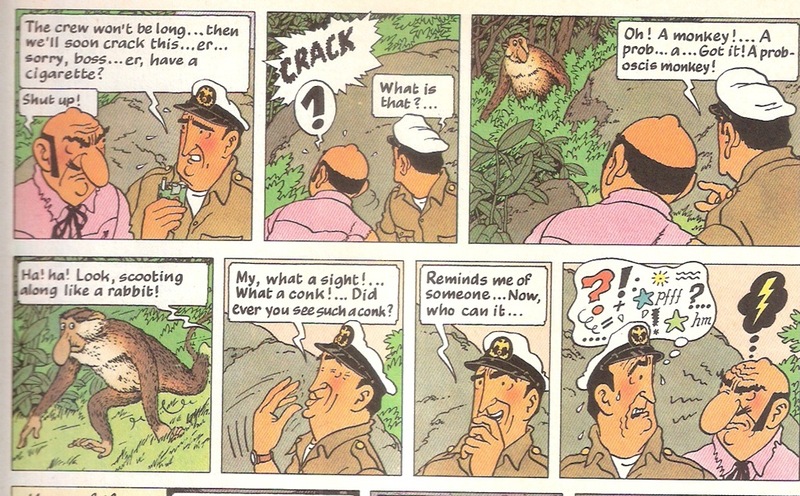 *Fans of It’s Not the Nine O’clock News who can remember the gorilla sketch (flange of baboons, whoop of gorillas) might be curious to know if there is a colourful collective noun for proboscis monkeys – like ‘hooter’. Apparently not. 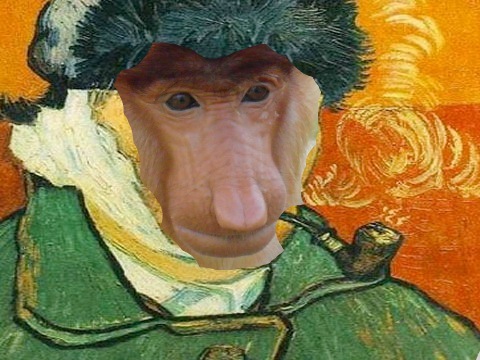 Troop of monkeys is the usual collective. Great photos, they are so like us humans. 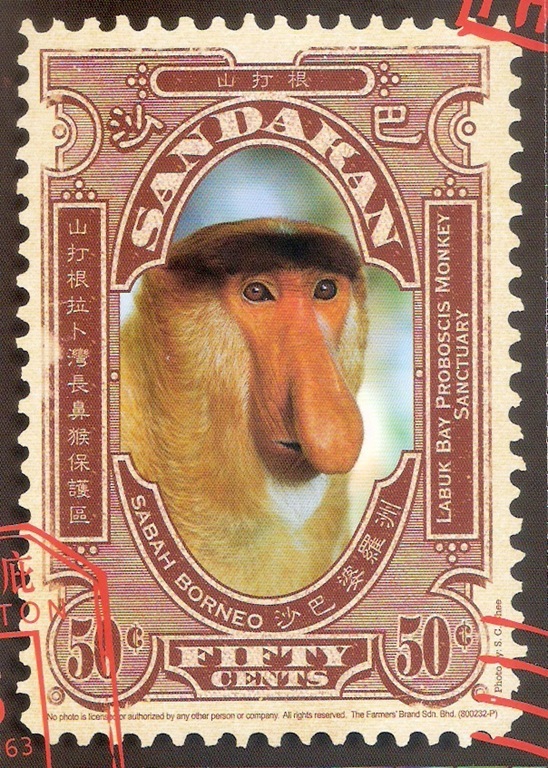 I forgot to mention that the Malay name for a proboscis monkey is Orang Belanda which means ‘Dutch Man’!